Ibuprofen and diclofenac are both medications used to reduce symptoms of inflammation such as pain, swelling and tenderness. Prescription ibuprofen is available in 800 milligram strength, while diclofenac comes in strengths of 100 to 200 milligrams. Both medications belong to the class of drugs called nonsteroidal anti-inflammatory drugs or NSAIDs. According to Drugs.com, they reduce the hormones in your body that promote inflammation. Both diclofenac and ibuprofen can be used to treat joint inflammation and menstrual pain. However, ibuprofen can also reduce a fever and pain from a headache, toothache or injury. Both medications can cause intestinal issues such as diarrhea, gas and constipation, tinnitus, or ringing in the ears, and dizziness. 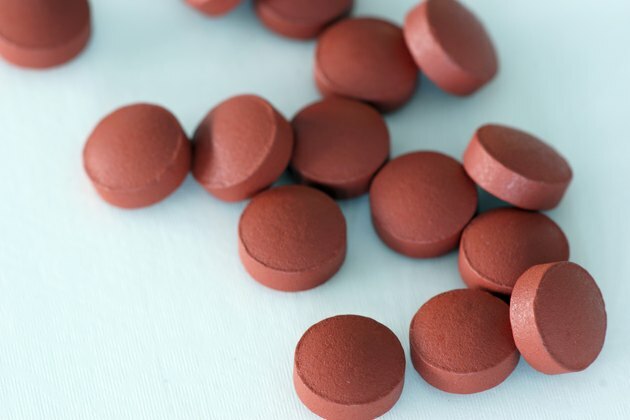 Serious side effects of ibuprofen that require medical attention include chest pain, black stools, swelling, yellowing of the skin, numbness, tingling, and fever accompanied by a rash or peeling skin. Diclofenac side effects that require attention include weight gain, lethargy, flu symptoms, rash, discolored urine, rapid heartbeat and difficulty breathing. NSAIDs such as ibuprofen and diclofenac can also cause serious liver injury, according to the November 2013 issue of "Clinics in Liver Disease." You should not take either medication if you are allergic to aspirin or any other NSAIDs. Difficulty breathing, hives and swelling of your tongue and throat can result if you are allergic to these medications and take ibuprofen or diclofenac. Both ibuprofen and diclofenac can increase your risk for stomach bleeding and intestinal perforation. They can also increase your risk of a heart attack or stroke. According to a report in the November 2013 issue of "American Journal of Managed Care," both ibuprofen and diclofenac increase your risk of heart failure, especially if you take more than the standardized dose. Never take more than the label or your doctor prescribes.